214 episodes à 42 Min. Brilliant, exciting, and sociocritical. 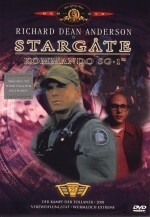 While the quality had begun to sag ever since season 7, the first 6 seasons of Stargate SG-1 were splendid: humorous, multifarious, and entertaining. Since the seventh season, the plots have been a bit uninspired, although there were a few good episodes. And the show hasn't been the same ever since they replaced some of the main characters, especially Jack O'Neill and Hammond. Nothing against Ben Browder, but his performance of Cameron Mitchell seems a little wooden and contrived at times. But then, so does the acting of several of the actors in the later seasons. Besides, I hate the Ori. Don't get me wrong. Not that I particularly liked the Gua'uld or the Replicators or any of the other enemies they faced. But I really can't stand the Ori. Whenever I see a Prior on the screen, I feel the urge to throw my remote control after him.